Getting the Fitbit set up was pretty straight forward — simply download the app from fitbit.com and install it on your machine. Within the app you can choose to set up a new device. To do this, you simply plug the provided dongle into your computer so that the Fitbit can pair with it. Follow some simple instructions on-screen and you’re ready to go. The hope is that this device will give me some insight into my sleep habits that will encourage a change in behavior. If that were to happen I’d be impressed. How does the device relate? 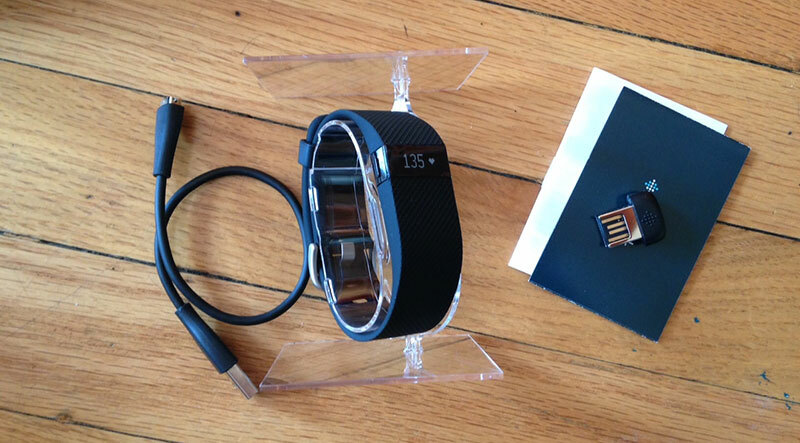 The Fitbit Charge HR is a pretty powerful device that tracks many different metrics including sleep (yay! ), steps, heart rate, distance, calories burned, and stairs. You can even set alarms within the app so that the device will shake your arm (and in turn, you) awake. All in all the Fitbit is easy to use. Just throw it on your wrist and you’re ready to go. The design of the Fitbit isn’t bad, but I can’t say I love wearing it on my wrist during the day. It’s generally comfy, but sometimes will slide around on my arm which can be annoying. And it’s sleek enough, but is obviously a fitness tracker and not a watch. I actually don’t mind wearing it while I sleep. I think the biggest difficulty for me has been simply wearing it. I find myself wanting to leave it at home some days or only put it on when I’m exercising. The battery life of this little wrist banger is pretty impressive. It lasts a good five to six days per charge, and when the power is running low you get some nice emails reminding you to charge it. Smart. And charging only takes a couple hours, so you can get it charged up easily while at work. Looking at the Fitbit screen isn’t that exciting, but it does pack a lot of information into a small space. You can toggle through the various data points by clicking the button on the left side of the device. And you can decide the order in which they appear by adjusting settings within the app. The iOS app is pretty slick and easy to use. You get an upfront view of your daily totals and can dig into each metric for more detailed info. It’s also fun to use the “Challenges” within the app to compete with friends. The desktop app has a nice Dashboard view, but each of the core sections (Dashboard, Log, Community) have a different layout and feel to them, which makes the experience feel a bit disjointed. I can see where the Log feature would be useful, but it feels a bit like data-entry to me so I’m less inclined to use it. Maybe if I get REALLY into using the Fitbit my attitude will change. I didn’t have any expectations when I first started wearing my Fitbit. During the first week or so, I was excited to try to meet my step goal, but that interest slowly waned. I was also curious about the sleep tracking component, but the data seems a bit too simple to keep me engaged. I think I’ll need to tie my sleep to something else — possibly compare it with food I’m eating or workouts — to see what impact those activities might have on my sleep habits.